On July 18, 2009, 62-year-old Ji Guizhen, a Falun Gong practitioner from Suzhou, Jiangsu Province, China, was arrested for her beliefs. Her daughter, Xu Anlan, and other family members haven't seen her since. After being illegally imprisoned for a year, Ji Guizhen was handed a two-year labour camp sentence for possessing Falun Gong informational materials calling for the end of the persecution. Now, Ms. Ji is imprisoned in the Women's Prison of Nanjing. Birgit Simon, the mayor of Offenbach am Main, and Ms. Xu. Ms. Ji's daughter, Xu Anlan is a German citizen living in Offenbach am Main. 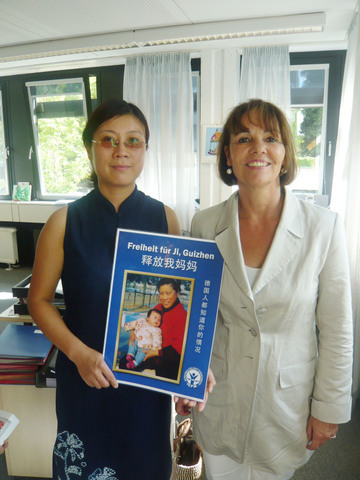 On August 24, 2010, Ms. Xu went to the office of Birgit Simon, the mayor of Offenbach am Main, asking for help to rescue her mother. Xu Anlan told the mayor about her mother's experience. Another Falun Gong practitioner, Wang Zhen, also told the mayor his experiences of being tortured in a Chinese labour camp. Since he refused to renounce Falun Gong, the police tortured him and injured his knees. He just had knee surgery in Germany. Concerned about the human rights situation in China, Ms. Simon said that she will do her best to help Xu Anlan.